^ "HotHouse Theatre". www.hothousetheatre.com.au. Retrieved 2008-06-22. ^ Albury Wodonga Cycling Club. "Albury Wodonga Cycling Club". Retrieved 2013-02-11. ^ Country Racing Victoria. "Wodonga & District Turf Club". Archived from the original on 7 January 2009. Retrieved 2009-05-07. ^ The SS&A Club. "SS&A Wodonga". Retrieved 2009-11-13. ^ "UNITED FRONT: Border launches Premier League club". www.bordermail.com.au. Retrieved 2014-11-05. ^ "Biggest Rolling Pin – Wodonga, Victoria". Archived from the original on 2007-10-17. Retrieved 2007-10-07. ^ "North East Rail Upgrade – Project overview". Department of Transport. www.transport.vic.gov.au. Retrieved 2008-06-22. ^ "Mylon Motorways – Temporary Timetable List". www.buslines.com.au. Retrieved 2008-06-22. ^ "WODONGA SENIOR SCHOOLS SET TO IMPROVE". Media Release: MINISTER FOR EDUCATION. www.dpc.vic.gov.au. 3 October 2005. Retrieved 2008-06-22. ^ "Flying Fruit Fly Circus's school destroyed". The Age. www.theage.com.au. 3 February 2003. Retrieved 2008-06-22. 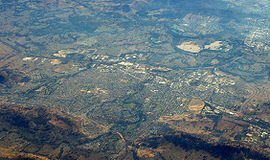 ^ "FRUIT FLIES TO FLOCK AT WODONGA WEST". Media Release: MINISTER FOR EDUCATION. www.dpc.vic.gov.au. 28 April 2004. Retrieved 2008-06-22.